I was scheduled to be induced one week early with my first pregnancy due to a high risk factor involving a DVT blood clot. However, my water broke two days before I was to be induced! I can only speak from one experience with it since I am still anticipating labor and delivery with my second pregnancy. However, below are a few pieces of information based on my experience to help you learn a little bit more about what to expect when your water breaks. I’m sure it’s not the same for everyone, but this is how it happened for me! Note: If you are nearing labor & delivery have you taken a prenatal class yet? Most hospitals offer them, but if the idea of going to one there stresses you out you can take a free online prenatal class taught by a labor and delivery nurse with over 10 years of experience here! According to WHAT TO EXPECT (their link here has some great resources regarding your water breaking) the rate of water breaks in pregnancy prior to active labor is actually only 15%. So if it’s a big fear of yours take heart that it’s not very common. However, it does happen – and it happened to me! To help you feel a little bit more prepared below are some thoughts on my experience. Free Printable Hospital Bag Checklist – With Note Of What I Actually Used! It may not happen this way for everyone, but when my water broke it was sudden! I was actually using the restroom when all of sudden my urine stream didn’t stop when I thought I was done! (If you’re wondering how to tell if your water broke or you peed, that’s how I really knew – I couldn’t make the fluid stop coming out like you can when you pee.) It did let up enough that I tried to stand and wash my hands after a bit, but then even more came gushing out. Now in terms of what to expect when your water breaks I will say – there was a bit of warning. I had some signs of water breaking soon even though I didn’t realize it at the time. I actually went into the labor and delivery triage at my hospital the day before my water broke thinking that it may have already happened. I had a slight trickle that I thought was not urine that day and it seemed out of the ordinary enough that I thought it may have been my water breaking. They tested me at labor and delivery, told me it wasn’t, and sent me back home. However, it was the next day that my water suddenly let loose! Even though their test indicated that it was not, I believe there may have been a slight leak that day that was a precursor to my full water breaking. This part of my experience really surprised me! In the movies and tv shows it always looked like the woman’s water broke into a big pile and then it was done. I had a skewed understanding of what to expect when your water breaks. In the movies the mother would be whisked away to labor after she left a puddle on the floor and that was all you saw. Mine wouldn’t have stopped at one puddle! Once my water broke it continued to gush for hours and hours – almost all the way through my labor! It was terrible every time I tried to stand up. I gushed fluid everywhere! I was VERY VERY glad that I had some Depends on hand to wear as soon as it happened. I had purchased them for postpartum bleeding, but ended up using most of them to contain my gushing water until I made it into the hospital bed. If you don’t have any on hand for your delivery or postpartum period, I HIGHLY recommend that you purchase some! You won’t be sorry even if you don’t need them to contain your water after it breaks. This was another part of my experience that didn’t line up with what I have observed in movies and tv shows. Just because your water breaks, it doesn’t mean your labor will begin! You can have your water breaking without contractions. I just assumed that labor was imminent when my water broke, but when I arrived at the hospital several hours later I was still not having contractions. I ended up having an induced labor since the baby was losing fluid but my body wasn’t naturally beginning the delivery process. So when you’re thinking about what to expect when your water breaks don’t assume that contractions will immediately follow the event! NOTE: I learned later that I could have requested to wait several more hours after my water breaking before starting the induced labor. If I have a similar experience with another pregnancy I WILL DO THIS. Induced labor was not fun! Be sure to ask your doctor for the specifics of what is safe for you and your baby if you find yourself in this position. 4. When your water breaks it can be messy! I touched on this a little bit above, but be prepared that if your water breaks it can be MESSY! If I hadn’t had Depends to contain all of the gushing fluid I don’t know how I would have made it into the hospital without leaving a disgusting trail of liquid. I certainly would not have been able to walk in, and probably would have forever ruined many towels. I will be carrying at least one Depends with me in the last weeks of another pregnancy just to be sure I’m not caught unprepared if my water breaks somewhere unexpected! Even if your water breaks at home, be prepared that it may be a messy occurrence. As I mentioned above, WHAT TO EXPECT states that the average rate of water breaks prior to active labor is only 15%. If you are expecting then the odds are in your favor that you will not experience your water breaking prior to your arrival at your hospital or birthing center. 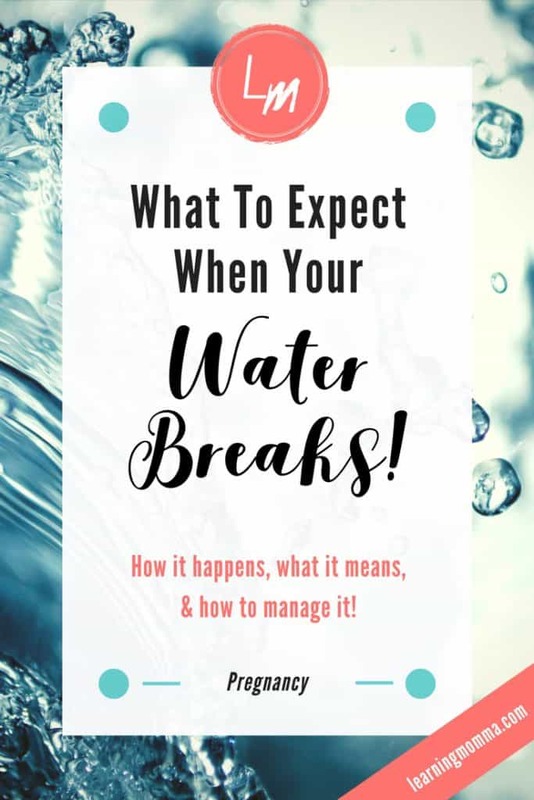 If you are one of the few who does experience your water breaking before your labor begins remember that it can happen suddenly, it’s not just a quick and over occurrence, it doesn’t mean you will immediately go into labor, and it can be very messy! Remember that you may be able to wait longer than your doctor initially states before starting induced labor if your body hasn’t naturally progressed to it. Be sure to ask them about it. If you are in your third trimester, don’t forget to also prepare for your hospital stay and postpartum recovery! Read and download my free checklist for what to pack in your hospital bag HERE. 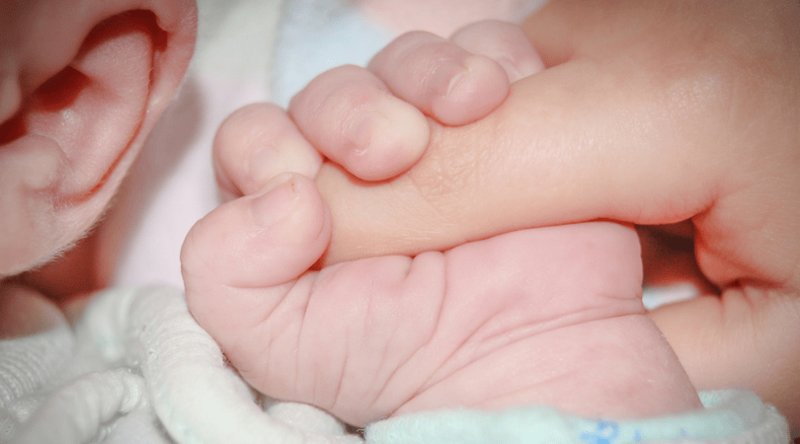 Read about what to expect in your postpartum recovery and how to prepare HERE. If you are an expecting mommy, best wishes with the remainder of your pregnancy! I hope these pieces of my experience help you to feel a little bit more prepared for your own.